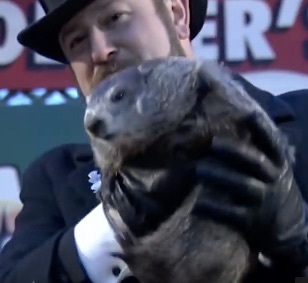 I’m pretty sure the nation’s favorite groundhog, Punxsutawney Phil, knows more about the weather than he does about markets, and I’m not all that sure he knows anything about the weather! In fact, I don’t understand the underground methods of this rodent resident of Gobbler’s Knob at all. It would seem to me that sighting his shadow should indicate a nice sunny day, which in turn should indicate spring is just around the corner. How can he scowl and crawl back into his hole on a day filled with sunshine? If you ask me, he’s somewhat of a weather permabear. Hats off to ya, Phil. The moral of the story is that, if you’re going to be a permabear of the permafrost, at least be cute, and you’ll still be popular with the people. I can no more tell you what the market is going to do on Monday than I can decipher the fathomless methods of Phil. The market, like Phil, has it own ways, and obviously the first person to understand them all will become the world’s first trillionaire. However, there is one thing that a day like Friday, after a week like this week, can show you; and that is how quickly — even when the whole world looks like economic sunshine — everything can become overcast. The Fed’s prediction is, in fact, better than anything any EverTrumper could have hoped for from the Donald’s tax plan. Wages also cartwheeled into the air (+2.9% annualized), higher than the most optimistic economists expected (at least, on the nominal print), and jobs came in well above their most hopeful guesses (at 200k new jobs versus the anticipated 180k). So, the wealth is trickling down even as the rich get richer … or so it would seem. And all of this happened at a time when most market tellers have been singing about how the whole global economy is humming along in harmonic coexistence. Only a few days ago, consumer confidence was the highest it has been in the history of the confidence game. Numbers have never been gathered that reached this high. Real consumer spending reached from 3.2% to 4% in a single leap, and private fixed-investment growth boiled over from 5.2% to 9.2%! These are truly Trump-sized numbers. The Dow’s 666-point plunge on Friday capped the worst week for stocks in two years (for all of major US indices)! Thus, the Dow’s scored the sixth-largest daily point decline in its nearly 150-year history. In fact, the day ended with the Dow’s largest overall point drop since Lehman Brothers. As a result of all this, the CBOE Volatility index rose from 11.08 to 17.31. The VIX (another volatility measure) also took its biggest spike upward since August 2015 when the world experienced the Chinese flash crash due to devaluation of the yen. It was the worst week in stocks for two of China’s major indices since 2016, too. And the worst for Germany since February of 2016 (the last big global plunge I predicted would come due to a change in interest rates). The DAX has fallen about a thousand points in two weeks, going negative for the year. The Eurostoxx Index dropped five days in a row, its longest losing streak since November. Why? While there are various influences around the world, one answer seems most apparent above all — at least for what happened in the US: the benchmark 10-year yield rose to 2.85 percent (a four-year high), and 30-year US treasury bonds saw there worst weekly increase since the election (breaking through the feared 3% top-of-the-trend barrier and ticking up midday almost to 3.1% before settling solidly above the barrier at 3.08). This steepened the US yield curve — too long too flat — the most since the election. And all of this is what I have been proclaiming for, at least, a couple of years now — that the end the Federal Reserve’s fake recovery and particularly, of late, the trumped-up rally would come from the real rise of interest rates when the Fed starts real quantitative squeezing. That has barely begun, and yet it is already creating serious tremors that could signal a rout in bond funds. What has people running scared is the potential collapse of the biggest bond bubble in the history of global finance. A mitigating factor could come from people taking money out of the stock market if they reinvest it in actual bonds (different than investing in bond funds). That could take some pressure off of bond interest by increasing demand so that those selling bonds don’t have to offer as much yield to attract buyers. A slight drop in interest could, in turn, take pressure off bond funds. Maybe. With half the earnings season now reported, almost 80% of companies beat expectations (the overall sunny setting that I said all of this happened in), and yet the market shudders. So, the key factor in the market’s fall this past week seems to be all about interest rates. Is this the beginning of the Epocalypse? As I said, I can no more tell you where the market is going Monday than Phil can. Everyone knows the market needed a correction, and that could be all this turns out to be. In fact, I am more inclined to think it will only be a correction than to believe this is the complete demise of the tRump Rally and the great crash into the Epocalypse I keep writing about. For now, I anticipate that the Trump’s tax cuts will create a lot more levity for the market than the weight of interest pressing down upon it. I think the market is merely feeling that weight for the first time in years as rates finally break above their trend lines. That mere nudge is giving people jitters. What is troubling people the most is not the height to which rates have climbed back up to, but how unexpectedly and quickly they have made that dash. It may be that there is much less elasticity between the Fed’s tightening and a rise in long-term interest than the Fed thinks. Maybe this case of the jitters is nothing more than a temporary and needless panic pushing up interest. IF, HOWEVER, IT IS THE DIRECT MARKET-BASED EFFECT OF SHRINKING MONEY SUPPLY ON BOND RATES, WE ARE IN BIG TROUBLE QUICKLY. Remember, we have never done this before. Even central banks do not know what effect will result from their cause. The shrinkage rate of money supply was set by the Fed to double in January, and that wouldn’t be felt until the end of January because it has typically been at the end of each month that the Fed has made its biggest reductions in its balance sheet. Here we are at the end of January and we feel a jolt that is like one of the larger Oklahoma earthquakes in that it is happening in a place that is not supposed to be getting earthquakes, so you wonder if it is because of what mankind is doing in the ground under you. While clouds are a good thing in Phil’s way of thinking, they are not in mine. Deutsche Bank. One of the world’s largest and oldest banks, Deutsche Bank, is still trying to crash. Does that matter? Well, even the bank’s own Binky Chadha is waving a red flag about the risk of global contagion in the global marketplace because the correlation in market moves between asset-classes is now at its highest. That correlation in movements and momentum now matches its previous peaks of 2012 and 2010. The record-high risk of contagion around the world in all asset classes means that the fall of Deutsche Bank could bring the fall of all asset classes around the world because it is deeply involved in many asset classes around the world. DB (not to be confused with that guy named Cooper who plunged from the sky and lost all his money decades ago) is already the major factor in Germany’s market plunge, but it doesn’t have to be Binky Chadha’s bank that takes down the world. High correlation of moves between markets means anything big from anywhere can bring down everything as a catalyst due to the problems that make markets rickety all over the world. The catalyst for contagion can come from oil, bonds, banks, or out of the blue, hitting one country and knocking on to others at a time when markets everywhere have reached like the tower of Babel to touch the gods. Binky, after all, is not saying the world’s collapse will start with his own bank. Nevertheless, let’s take a look at Binky’s bank all the same. It is, after all, really, really big, and really, really ugly. It ain’t no cutiepie like Phil. Again, Friday was interesting because it was the day of Deutsche’s earnings report where DB failed to meet even the most pessimistic expectations of the most glowering economists in the land, and it had already warned its prognosticators that a slump was coming. After about a year of restructuring, DB’s revenue sank to the lowest in seven years, casting clouds over whether its fairly new CEO is on the right track at all. Just about every area of its business activity evaporated more this year after seven years of drought. Even cost control was out of control, and that is supposed to be the Big Chief’s strongest skill. The bank’s 1.3-billion-euro loss was a hundred-million euros worse than the most dismal forecast and nearly triple the consensus expectation. Nothing positive in those clouds to give ol’ Phil any hope of an early spring … or any spring at all. Revenues from the bank’s fixed-income and currency trading fell 29% year-on-year. CEO John Cryan must be doing exactly as his name implies since eight of the ten quarters he has reigned have seen falling revenues. Don’t cry for Cryan, though. He did manage at the close of the year to pay a bonus to the top peeps in his corporate and investment bank. Since lowering costs hasn’t done anything for him, perhaps he just needs to strengthen his skill at lowering expectations. He seems to be working on that. So, I have hope he’ll do well at it. Global debt ratios have surged 50% higher against global GDP than they were when the Lehman crisis erupted. That means contagion risk is not just broad, but also deep. White attributes this feverish rise in debt risk to QE liquidity leakage from the West. Essentially, artificially lowered interest rates have enticed nations all over the world into much deeper debt. Even if interest rates stay down, these nations will be in deep trouble if the dollar rises in value. Right now the dollar is generally weak around the globe, but if the dollar strengthens, their debt, which is denominated in dollars, could become unpayable as they will have to exchange their currency for fewer dollars in return. The US Federal Reserve is already reversing bond purchases – ignoring warnings by former Fed chair Ben Bernanke – and will ratchet up the pace to $US50 billion ($62.4 billion) a month this year. It will lead to a surge in supply of US Treasury bonds just as the Trump Administration’s tax and spending blitz pushes the US budget deficit toward $US1 trillion, and China and Japan trim Treasury holdings. It has the makings of a perfect storm. At best, the implication is that yields on 10-year Treasuries – the world’s benchmark price of money – will spike enough to send tremors through credit markets. And that appears to be what we are just starting to experience this past week. At this point, the market is just feeling the first gusts of concern; but later this year when that reversal of bond purchases starts to build up to full force headwinds, the shaking could become severe. If this past week, Friday in particular, was nothing else, it was a clear revelation of just how sensitive this overblown stock market is to a mere breath of rising interest rates. There was no failure of Deutsche bank on Groundhog Day. No, the Goliath Trump Rally was blown over this past week by a whisper — a smaller actual rise in long-term credit costs than the Fed’s 0.25% periodic rise in its interest targets — a rise that may even settle right back down to nothing because it’s not a target; it’s an unintended effect. A strong market? Or a rickety scheme built by the Fed over a cavern of debt that was used to create “a wealth effect?” I’ll note that effects often die as soon their causes reverse, which makes this particular market highly sensitive to any change in the gravity of debt … as I’ve said all along. Punxsutawney Phil may be glad he’s gone back underground to wait out the stormy weeks ahead with so much bluster over an incremental uptick in bonds.